Maximum Tripod Height of 65"
Minimum Tripod Height of 11.7"
Giottos' VGR9264-M2N Aluminum Tripod/Monopod W/QR Ballhead is a solid reverse structure professional tripod designed according to the Golden Ratio shown in Da Vinci's famous picture of the Vitruvian Man. The collar is made from aluminum alloy with an increased molecular density. 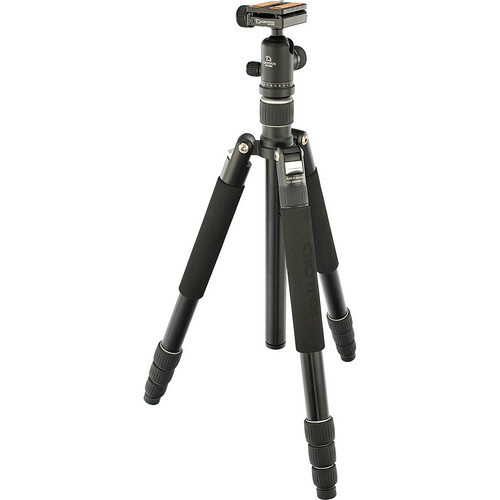 It folds down to a manageable 17.7" size and can be converted to a 67.4" monopod. This aluminum support will extend to 65", but its minimum working height is less than a foot--11.7"--and it folds down to 17.7". Although it weighs just 4.3 lbs, it can support up to 13 lb. The included quick-release ballhead has a bubble level and is Arca-compatible. Plus, one leg of the tripod combined with the center column converts to a monopod that extends to 67.4" and collapses to 32.5". The 4 tripod leg sections use a quick twist-lock design, and the rubber feet are supplied with metal spikes for use on uneven or rough terrain. 2 Year Limited Warranty, Extends to 12 yr with Online Registration. Box Dimensions (LxWxH) 20.8 x 5.4 x 5.4"